The finest, most complete bicycle in the world. Luxury equipment, includes chrome fender, cycelock, spring fork, special colors, and many other outstanding Schwinn exclusive features. Don't miss this bicycle at your dealer. 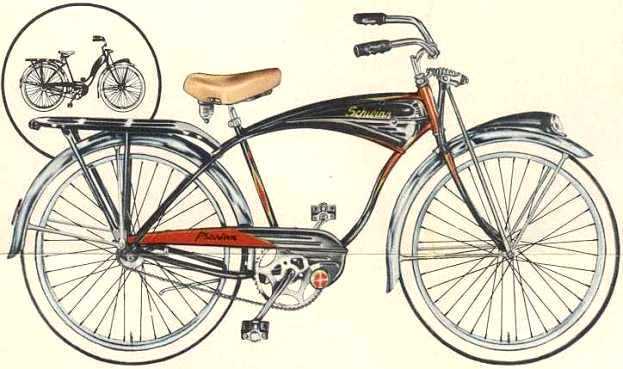 See the full 1950 Schwinn catalog. The most beautiful bicycle in America! 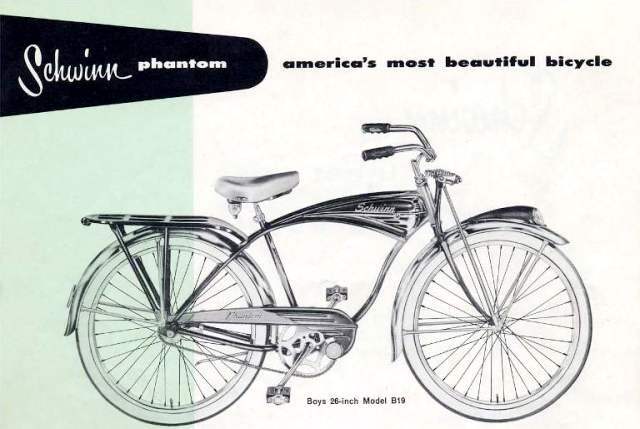 The Phantom is the finest balloon- tired bike in the big Schwinn line! Look at these features built into America's most beautiful bicycle! The famous Schwinn patented cantilever frame, chrome plated fenders, Schwinn spring fork, Schwinn Cycle-lock, automatic stop and tail light, chrome-trimmed tank, chrome rims, and genuine leather saddle. Get all this and more as standard equipment on the new Schwinn Phantom -- guaranteed against theft loss for one year. Available in many attractive color combinations. Frame Electro-forged, exclusive Cantilever construction, fully streamlined, removable seat post clamp. Fork Schwinn patented spring fork with built-in Cyclelock. Crank Set Drop forged high carbon steel, triple heat treated cups and cones, turned from fine grain bar steel, chrome steel balls, two point ball bearing races. Rear Hub Standard coaster brake. Front Hub Schwinn built with removable bearing cups. Handlebar Stem Schwinn gooseneck from drop forged steel. Handlebar Chrome plated, SB 26 x 8. Kickstand Patented dust and rattle proof construction. Chain Guard Embossed design, secured directly to frame. Head Set Schwinn built, turned from special fine grain steel, triple heat treated cups and cones, chrome steel balls. Tank Embossed design, chrome trim, with self contained horn unit. Fenders Chrome plates, extra wide, reinforced, rigid semi-tubular braces. Rear braces attached directly to frame. Head light Schwinn built, streamlined, self contained fenderlite. Luggage Carrier Streamlined with built exclusive stop and tail light. Tires Schwinn Typhoon Whitewall 26 x 2 1/8" cord balloon. Rims Schwinn built, tubular chrome plated S-2. Saddle Schwinn approved Deluxe, top grain leather. Reflector 3 1/4" Stimsonite approved reflector. Pedals Schwinn approved Deluxe, finest quality. Juvenile model of America'f finest Bicycle! The Superb design of the 26-in. Phantom built into a 24-in. model! Newest addition to the Schwinn family- the dazzling 24-inch Phantom - truly America's most beautiful bicycle! Just like it's "big brother", it has the famous Schwinn patented Cantilever frame, chrome plated fenders, Spring Fork, Schwinn Cyclelock, chrome trimmed tank with built-in horn, Rocket Ray headlight, built-in kickstand, and many other outstanding Schwinn Quality Features. Available in many attractive color combinations. Fully protected by the Schwinn Guarantee. If you want the finest balloon-tired bike money can by, here it is. 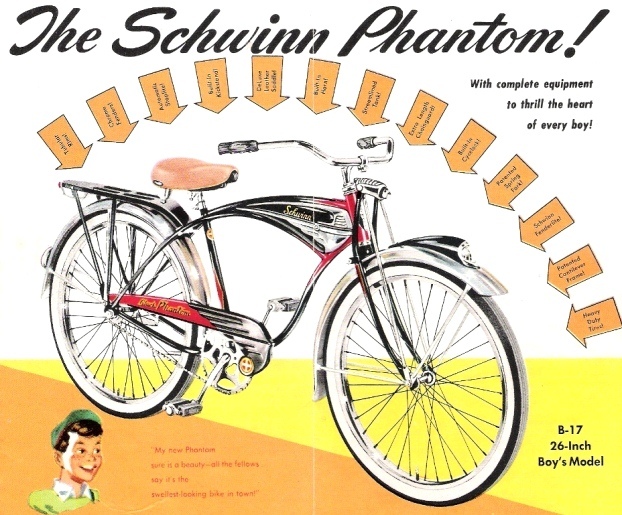 The most beautiful bike in the famous Schwinn line, the Phantom is champion of them all- with deluxe features and complete equipment to thrill the heart of every boy. "My new Phantom sure is a beauty- all the fellows say it's the swellest-looking bike in town!" See the colors: Coach Green and Black, Light red and Black. You've never seen such a bicycle! Completely equipped with every accessory imaginable to delight the eye of every youngster. Finest Schwinn craftsmanship throughout. The proudest achievement of three generations of experience in designing and building fine bicycles makes the Phantom the most wonderful bicycle any boy can own! Guaranteed against loss for one year- against defeat As-Long-As-You-Own-It. 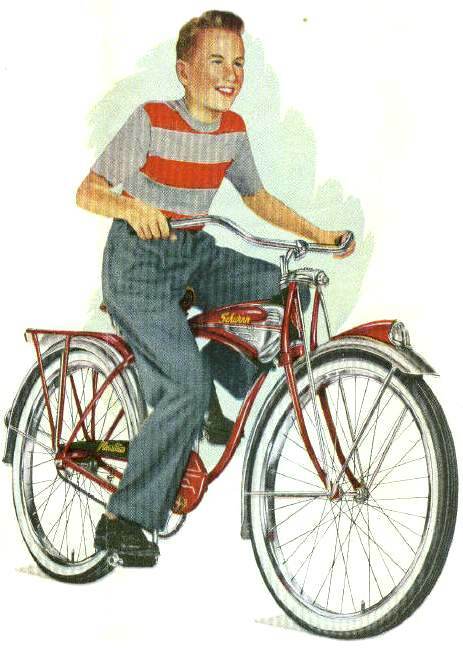 See the full 1952 Schwinn catalog. With complete equipment to thrill the heart of every boy! My new Phantom sure is a beauty-all the fellows say its the swellest-looking bike in town!". The Phantom is the finest balloon-tired in the Schwinn line! You've never seen such a bike! Completed equipped with every accessory imaginable delight the eye of every youngster. Finest Schwinn craftsmanship throughout. The proudest achievement of three generations of experience in designing and building fine bicycles makes the Phantom the most wonderful bike in any boy can own! Juvenile model of America's fines bicycle! This dazzling 24-in. 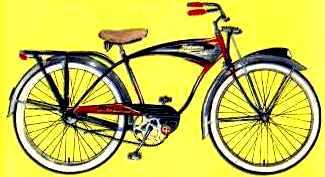 model has the famous Schwinn patented Cantilever frame, chrome plated fenders, Spring Fork, Schwinn Cyclelock, chrome trimmed tank with built-in horn, Rocket-Ray headlight. See the full 1953 Schwinn catalog. "My new Phantom sure is a beauty-all the fellows" say it's the swellest looking buke in town"! Nothing in the world like it! Schwinn Phantom is the most beutiful bike you can own! The most beautiful bike you can own! You've never seen such a bicycle! Completely equipped with every accessory imaginable to delight the eyes of every youngster. Includes Spring Fork, Cyclelock, stop and tail light, chrome trimmed tank, cantilever frame, whitewall tires, genuine leather saddle, chrome fenders. 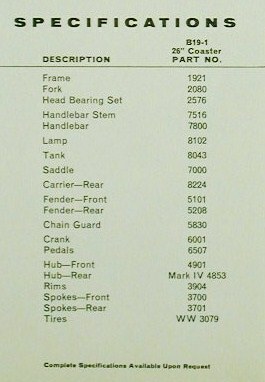 See the full 1954 Schwinn catalog. The Phantom is the most famous balloon-tired bicycle in the world, with beautiful styling and lavish equipment. The Cantilever frame, chrome-trimmed tank, spring fork, chrome fenders with built-in fenderlite and genuine leather saddle make the Phantom the best bike money can buy. FRAME- Schwinn balloon cantilever, girls balloon. FORK- Schwinn patented spring fork -- no Cycelock unless ordered extra. CARRIER - Streamlined -- no stop and tail light unless ordered extra. FENDERS- Chrome plated, extra wide. SADDLE- Deluxe, top grain leather. RIMS- Schwinn tubular S-2, chrome. Colors: Red with black trim, black with red trim, green with black trim; also two-two tone blue on girls model only. 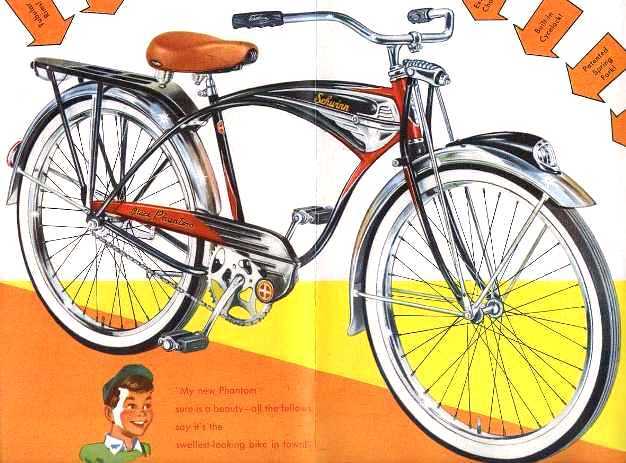 See the full 1955 Schwinn catalog. Most beatiful bike in the world! Spring fork, chrome trimmed tank with electric horn, chrome fenders, built-in fenderlite, genuine leather saddle, whitewall tires. Boys and Girls 26" models. Colors: red with black trim, black with red trim, green with black trim-also two-tone blue in girls model only. A breath-taking beauty of a bike! Colors: Black with red trim red or green with black trim. See the full 1957 Schwinn catalog. Most famous balloon model a perennial. Phantom deluxe spring fork balloon model. Features; Spring fork, Schwinn Cantilever frame, tank with horn, built-in Schwinn Fenderlite, two – tone colors, extra-wide chrome fenders, rear carrier, whitewall balloon tires, large saddle. Coaster brake only. Shpg. No. Size Description Wt, Lbs. See page 30 for other coaster brakes, equipment options and how to order. Color: Radiant Red and Black, Radiant Green and Black and Red. 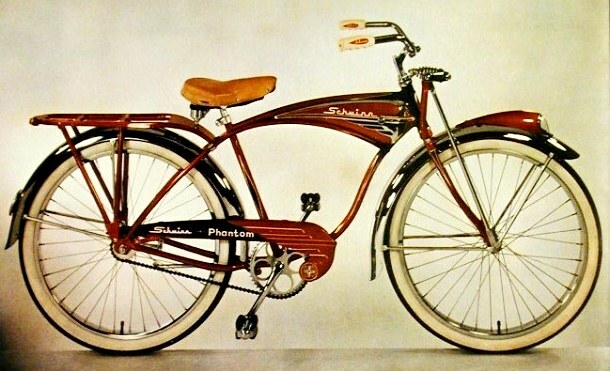 See the full 1959 Schwinn catalog.